Published by Patumwan October 31st, 2007	in Books, Builders, Customs and Editorial. I know pretty well Jay Barbieri who interviewed me many times for his TV show “American Thunder” on Speed Channel. So, when Motorbooks sent me his new book, it was my time to learn what he had to say to me and to you. First, Jay is not only a TV producer traveling from shows to shows but also a biker with a respectable number of miles ridden every year on his bikes. So, like me, he belongs to the Motorcycle Culture and has quite a few stories, some very humorous, to tell you about what it is to live our lifestyle. Jay tells you the good, the bad and the ugly experiences of owning a bike, riding, participating to rallies, etc. If you are new to the motorcycle world you are going to learn a lot about how to avoid mistakes, feel comfortable and knowledgeable among bikers. If you are experienced, you are going to enjoy a lot his sharp and twisted sense of humor when he tells you his ventures on the road and during bike events. . It might take a bit more than a book to pull off the “knowledgeable” part….? Foward by Michele Smith now that may be the part worth reading. I just got my copy from Jays signing at the SEMA show yesterday (Thurs). 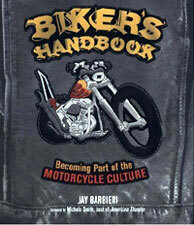 Jays is a nice guy and has the passion for motor cycles and it shows throughout his work. His book is easy reading with some very cool illustrtions and very well worth the 20 bucks or so. Thanks guys, glad you like most of what I’m saying. Just so people understand, I’m not trying to tell anyone how to be or what they should be. I’m just trying to spread the word that being authentic and understanding the culture is still a big deal, somehow over the last few years that got lost.